"A & K Custom Cabinetry does amazing work! If you are looking for a company to deliver beyond your expectations you want to use A & K. They deliver an amazing product! We put our full faith and trust with A & K Custom Cabinetry and they helped us design amazing cabinets in our home and at our office. We have a gorgeous entertainment center, bathroom cabinets, and kitchen and dining room cabinets in our home. At our office building we now have custom desks and cabinets that allow us to utilize our office space. The cabinetry is beautiful." 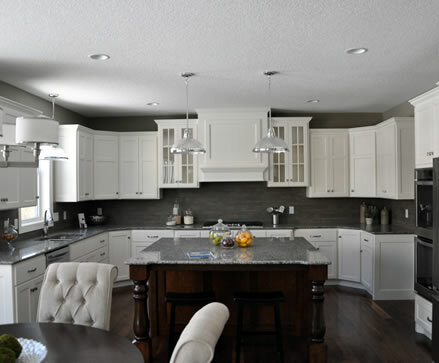 "We hired A & K Custom Cabinetry in 2003 to do all of the cabinet work in our house we were building. Their work impressed us on multiple levels. Ron and Neil had a sense for knowing what we wanted. They really listened effectively to what we were seeking, brought forward beautiful design ideas for our consideration, and did it all in a timely manner. Their attention to detail is unbelievable. In this day of cookie cutter cabinets it nice to see there is still a company that puts craftsmanship in their work. We have received numerous comments on the design and quality of our cabinets. We were so pleased with their work that when it came time to finish off our basement in 2006 we knew right where to turn for the cabinet work, A & K Custom Cabinetry. 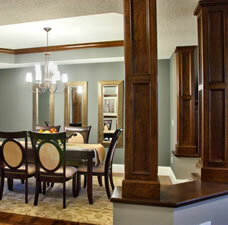 We would recommend A & K Custom Cabinetry unequivocally and would hire them again in a heartbeat." 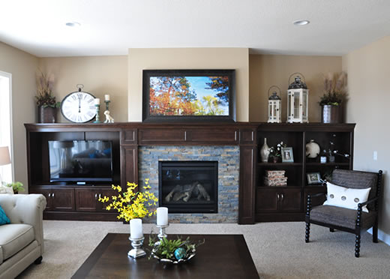 "We love everything about our finished basement, especially the custom cabinetry! Thank you for helping make it possible. We remember when you first visited our home. You took the time to get to know us, our tastes, and noted the overall design of our home. You asked us all the right questions and listened carefully as we described our plan for the basement. We knew as soon as we met you that we were in good hands. Next, it was pleasant to work with you as you developed designs and drawings. Your expertise was evident as you guided us through every detail including options that we had not thought of and even options that saved us money. The final installation was timely and proceeded just as you had described. The whole process was pleasant, prompt, and dependable. We can’t thank you enough." 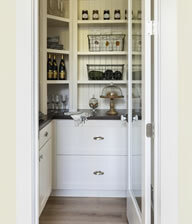 "A & K Custom Cabinetry built our kitchen cabinets, a pantry, and built-in benches near our mudroom. We loved the work they did so much, we asked them back to restore our woodwork and floorboards, install closet organizers, and build a custom bathroom vanity. They bring creative design ideas to each project, and the quality and craftsmanship of their work brings compliments from nearly everyone who visits our home. From the historic and traditional to the modern and trendy, A & K is the best in the business!" " Just wanted you guys to know how happy Denise and I have been with the quality of craftsmanship and the overall experience we had in working with your company during the two stages of cabinet completion for our lake home. You guys delivered what you said you would, fully custom, at a price that the big box stores couldn’t come close to! 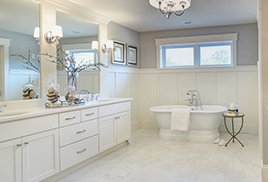 Thanks again for attention to detail and as you already know, we have been recommending your company to any of our friends and family looking for cabinetry work."